A new species of Tityus C. L. Koch, 1876 (Buthidae) has recently been described from Ecuador by Wilson Lourenco and Eric Ythier. I have only read the abstract of this article as authors publishing in Arachnida - Rivista Aracnologica Italiana are not allowed to send pdfs/copies of their article to other scientists (contrary to the practice of most other scientific journals) and my library's interlending department are not able to get copies either. 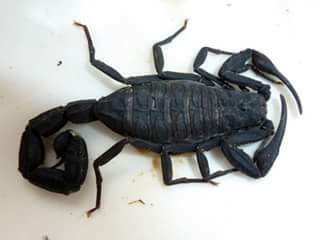 The status of the enigmatic buthid scorpion Tityus asthenes Pocock, 1893 is once more discussed. Described from Poruru in Peru, the species remains known by the female holotype only. A reanalysis of the several characteristics of the holotype demonstrates that the species is valid, but not a member of the subgenus Atreus (group Tityus americanus as suggested by Pocock) but rather belongs to the subgenus Tityus and to the group of Tityus bolivianus, consequently distinct from all other populations of Tityus (Atreus) distributed from Ecuador to Costa Rica. Previous suggestions that T. asthenes could represent a senior synonym of several other Tityus (Atreus) species were due to inadequate interpretations of their biogeographic pattern of distribution. Although the validity of Tityus asthenes is unquestionable, its precise range of distribution remains enigmatic since its type locality Poruru is not known from Peru and no further details are available about the collection of this species. A new species of Tityus (Atreus) is described from the cis-Andean rainforests of Ecuador and some taxonomic considerations are proposed for some related species within the subgenus Atreus. Lourenco WR, Ythier E. Another new species from the rainforests of Ecuador (Tityus cisandinus Lourenço & Ythier, 2017). Arachnida - Rivista Aracnologica Italiana. 2017. Thanks to Eric Ythier for informing me about their article and for allowing me to use a picture from the article.